One of my suppliers has Alabama SEC Champions gear ready for purchase. 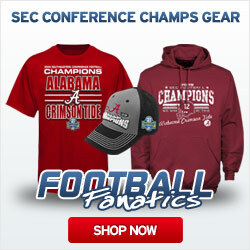 They have all kinds of merchandise from t-shirts to license plates celebrating the Crimson Tide’s SEC Championship win. They also have a full line of Alabama Crimson Tide vs. Texas Longhorns 2010 BCS National Championship Bound Dueling Helmets logo gear. Get your orders in fast if you want it by Christmas. “The Crimson Tide delivered a decisive victory over the number 1 ranked Gators just a few minutes ago, making Alabama the 2009 Southeastern Conference Champions. The reporters are still interviewing the players and coaches. The confetti has not settled to the ground, but already everyone is looking toward the National Championship game. Alabama turned in a great performance, easily managing to score early and often. The Tide moved the ball pretty much whenever and wherever they chose to. Florida made several mistakes that could have made it a closer game, but they really just never got any substantial momentum going. Although I enjoyed the game immensely, I have to admit being a little disappointed. I expected stronger competition from Florida. I am not one of these guys who keeps up with all of the stats and watches every team that plays every weekend, so I do not pretend to be at all qualified to comment on why Alabama was able to dominate Florida the way they did. I will leave that to the professional commentators and armchair quarterbacks. But after being ranked behind them for weeks, I really expected more of a battle on the field. Being a lifelong Alabama Crimson Tide fan, I am proud of our players. They played a great game, and I am looking forward to the National Championship game. Congratulations Alabama Crimson Tide Players!